When it comes to pound cake, I like enjoying it with fresh berries and a dollop of whipped cream. It's simple, sweet and so easy to make in a flash! But when I saw the recipe for Blackberry Swirl Pound Cake in the magazine, I knew I could easily substitute the blackberries for strawberries. It came out wonderfully and it's just as good as enjoying plain pound cake with fresh berries... if not better! The crumb of this pound cake is soft and tender while the swirl of sweet strawberries adds just enough sweetness without overdoing it. If I make this again, I would probably add more strawberry sauce and swirl it more so it's more visible throughout. Since I love strawberries so much, I drizzled some extra strawberry sauce used in the batter over the slices before serving... yum! Preheat oven to 350°. Lightly butter a 5-by-9 inch loaf pan and line with parchment, leaving a 2-inch overhang on all sides; butter parchment. In a food processor, puree strawberries with 2 tablespoons sugar. In a medium bowl, whisk together flour, salt, and baking powder. In a large bowl, using an electric mixer, beat together butter and 1-1/14 cups sugar until light and fluffy, 5 minutes. Add eggs and vanilla and beat to combine, scraping down bowl as needed. With mixer on low, add flour mixture in 3 additions, alternating with sour cream, beginning and ending with flour mixture. Transfer half the batter to pan and dot with 1/2 cup strawberry puree. Repeat with remaining batter and puree. With a skewer or thin-bladed knife, swirl batter and puree together. Bake until golden brown and a toothpick inserted in center of cake comes out clean, about 1-1/4 hours. Let cool in pan on a wire rack, 30 minutes. Lift cake out of pan and place on a serving plate; let cool completely before slicing. (Store cooled cake, wrapped tightly in plastic, at room temperature, up to 3 days.) 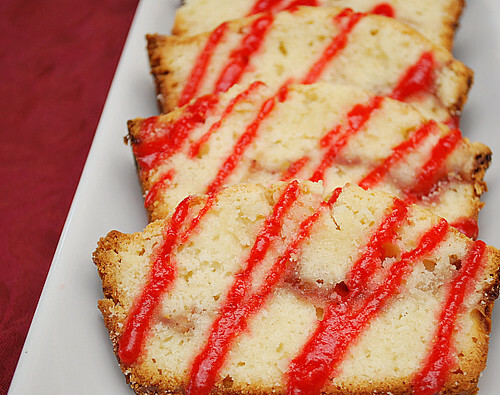 Cake can be topped with a drizzle of more strawberry puree and/or a dollop of lightly sweetened whipped cream. Wow. This pound cake looks amazing. I love the drizzle effect and the crumb of the cake. The cake looks great! I picked a ton of strawberries and all of your strawberry recipes look great! Love your blog. is it just me or under sugar does it say 1 1/4 Cups but no ingredient?? just want to see if I'm missing something? before I put this in the oven! !